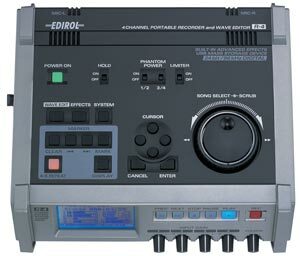 IF YOU ALREADY OWN AN EDIROL R-4 YOU MAY STILL PURCHASE SOME OF ITS ACCESSORIES FROM OUR R-4 WEBSHOP BELOW. 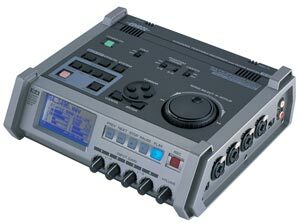 The R-4 is a 40Gb Hard Disk and Compact Flash Card recorder capable of recording uncompressed linear (WAV) files and up to four channels at once. In its current version here it includes support for Broadcast Wave (BWF) files. This means it can now write the required metadata to comply with BWF standard. This allows the R-4 to function as an even more powerful portable 4-channel field recorder with a wider range of potential uses making it easier to import the audio into a wide selection of devices and software programs. When a Project File is set to BWF on the R-4, the audio file written to the hard disk contains information about the recording time and the recording device in addition to the audio data. The resulting file can be loaded into a playback device or audio editor just like any conventional .wav file. The R-4 is uniquely designed to offer sound professionals a cost-effective, high-quality solution to multi-channel field recording. The R-4 can record at audio resolutions up to 24-bit/96kHz on all four channels for complete high-resolution multi-channel performance. The unit features a built-in limiter and 5 different dynamics processors - 3-Band Parametric EQ, 6-Band Graphic EQ, Noise Gate, Enhancer, and Compressor / De-esser. The R-4 records directly to an internal 40GB hard drive providing storage capacity for 58 hours of 16-bit/44.1kHz stereo recording, or over 17 hours at 24-bit/96kHz. The R-4 includes a powerful array of input and output options including 4 XLR/TRS combo microphone jacks with phantom power, analogue phono output, S/PDIF Coaxial Input and Output, built-in stereo microphones, built-in speakers, and a USB 2.0 connection for Drag & Drop access via a computer. Compact Flash memory can also be used to backup and transport data. The R-4 has a large LCD display and features a Wave-Form Editor with a variety of functions for precision editing including trim, combine, split, and merge. The R-4 can drop markers anywhere within an audio file to quickly jump to important points in the file. The R-4 also offers an A-B Repeat allowing users to quickly and easily loop any section of audio. The R-4 includes a Pre-Record function which can capture as much as 29 seconds of audio to the record buffer before the record button is pressed. This allows users to press record after they hear what they want and still capture the material they really wanted. The R-4 also includes an L connector to allow any compatible video camera to sync start and stop with the R-4. The R-4 runs on either the included AC Adapter or 8 AA batteries and includes a Carrying Case with shoulder strap. The R-4 brings you a new generation of portable recording. Enjoy superb sound quality. Use the 40GB hard disk drive for extended recording. Record up to four channels at once. Edit waveforms on the recorder itself. All this plus a compact size and light weight that assure outstanding mobility in the field. Equipped with a 40GB hard disk drive, the R-4 can record up to 17 hours at maximum sound quality or up to 58 hours at CD quality. The four XLR/Jack combo-sockets come with switchable phantom power and give you a choice of MONO, STEREO, STEREO X2, or 4CH recording. Digital input/output is also provided. 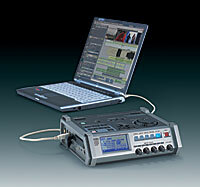 Four-channel recording gives you exceptional flexibility. For example, you can use mics to capture the ambience of a performance hall while using line input to record the performance itself. Or you can record at several different level settings simultaneously. The R-4's omnidirectional, back electret condenser microphones offer superb transient characteristics and vibration resistance. The R-4 lets you tailor the sound during both recording and playback. The R-4's L terminal lets you connect a similarly equipped digital video camera to synchronize the camera start/stop while R-4 is recording. Counting the camera's two channels, this configuration gives you a total of six audio channels — a wealth of audio data to get creative with. The R-4 is all you need to edit waveforms. Just watch the waveform on the LCD as you edit. Scrubbing playback with the shuttle dial lets you set the edit points precisely by sound. The R-4's built-in speakers make it easy to monitor recorded sound without headphones. The USB 2.0 high-speed mode transfers data about 20 times faster than DAT. You can also use the R-4 as a 40GB storage device. Edit R-4 files directly from DAWs and other applications. The Compact Flash slot makes it easy to read or write recorded files. You can use Compact Flash memory to give data to colleagues or to transfer data to equipment not equipped with a USB interface. The R-4 runs on eight AA batteries or with the AC adaptor. The R-4 comes with a soft carrying case with a shoulder strap for safe, comfortable use in the field.